Now that I’m at Part 5 and into the missionary expansion of the church, Luke is even less helpful in answering the question that I want a clear answer to. My question was not Luke’s question. After these passages, I will stop this particular review from the book of Acts, even though I’m 10 chapters from the end. I will share some of my forming conclusions in tomorrow’s post. Certain people came down from Judea to Antioch and were teaching the believers: “Unless you are circumcised, according to the custom taught by Moses, you cannot be saved.” This brought Paul and Barnabas into sharp dispute and debate with them. So Paul and Barnabas were appointed, along with some other believers, to go up to Jerusalem to see the apostles and elders about this question. The church sent them on their way, and as they traveled through Phoenicia and Samaria, they told how the Gentiles had been converted. This news made all the believers very glad. When they came to Jerusalem, they were welcomed by the church and the apostles and elders, to whom they reported everything God had done through them. . . .
Luke speaks of the believers as a group. The teaching could have happened in their gatherings of believers. Luke’s point in Chapter 15 is to discuss how the early church dealt with the practice of circumcision. He doesn’t speak to the demographic make up of the group. We have no way of knowing if this was believers only group, or included the presence of seekers, God-fearers or the spiritually curious. The story that follows in this passage refers to the gathering of the church leadership. “The apostles and elders met together to consider this question” (v.6). At the end, the church (as a description of the believers as a group) affirms the decisions of the elders. Luke uses the word church to describe the body of believers. The believers are encouraged as they hear the letter, and they send off people. He went through Syria and Cilicia, strengthening the churches. Church refers to the gathered people, not to a particular meeting for the particular purpose of worship that we are looking for examples of. As they traveled from town to town, they delivered the decisions reached by the apostles and elders in Jerusalem for the people to obey. So the churches were strengthened in the faith and grew daily in numbers. Church refers to the gathered people, not to a particular meeting place. They are growing in locations, as well as new people coming to faith. Paul preaches in the synagogue over a period of three weeks and people come to faith. The location is not the gathering of believers called church, but reflects the evangelistic activity of the church in going where people are already gathering. Once again, the gatherings are in the synagogue. The people receive the message, examine the scriptures and over time believed. They were unbelievers to start with, and became believers after regular encounters with the word and examining the message for themselves. So he reasoned in the synagogue with both Jews and God-fearing Greeks, as well as in the marketplace day by day with those who happened to be there. . . . Paul then stood up in the meeting of the Areopagus and said . . .
Paul is in Athens, and since there is no church, he is out in the marketplace to gain new believers. Even though there are 11 chapters left beyond this point, (Acts 18-28), I don’t see a purpose in further examination of the missionary expansions of the gospel in the same level of detail at every gathering or mention of the word church. Paul re-visits churches, sets up leadership, writes letters that deal with various issues in various churches, and aids in the theological reflection of the nature of the church. By this point in the story, the organization of the church, the expansion of the church, various practices of the church are not described in Acts to the detail that will help answer the question. I don’t see a prohibition to inviting non-believers to a gathered assembly. I don’t see a command that requires inviting non-believers to a gathered assembly. I don’t see a pattern of either / or in the book of Acts that can tell me. 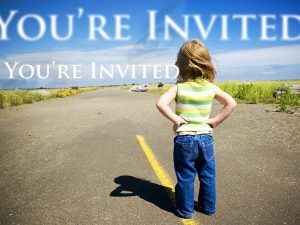 It is clear to me that the book of Acts cannot answer the question that I ask of it: Can we invite non-believers to our weekly church gatherings as we practice them now? In the next installment, I’ll share my conclusions and a few points from Paul’s letters. Each week at the same time, I send out new articles that might help your evangelism committee grow your church through personal evangelism, church invitations, and leading your congregation in evangelistic outreach. You’ll usually find a gem that you can use each week in or at least every other week. Join our community and share your thoughts.